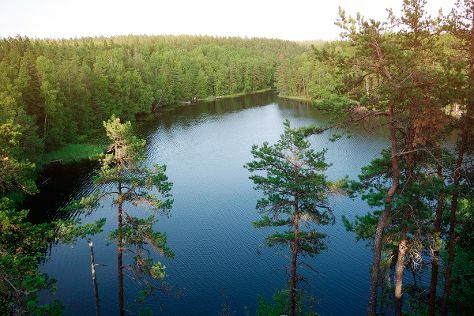 Escape the urban bustle at Nuuksio National Park and Niivermaki Nature Conservation Area. Satisfy your inner culture vulture at Sea Fortress Suomenlinna and The Esplanadi Park. Explore the numerous day-trip ideas around Helsinki: Sipoonkorven Kansallispuisto (in Vantaa), Teijo national park (in Pernio) and Arboretum Mustila (in Elimaki). Spend the 15th (Fri) exploring nature at Ekenas Archipelago National Park. There's still lots to do: contemplate in the serene atmosphere at Rock Church, identify plant and animal life at Riverside Park, get outside with King's Road, and stroll through Pornaistenniemi Nature Trail. To see reviews, ratings, and more tourist information, read our Helsinki trip builder website . If you are flying in from United States, the closest major airport is Helsinki Vantaa Airport. In March, plan for daily highs up to 37°F, and evening lows to 23°F. You'll have a few hours on the 19th (Tue) to wrap things up before traveling home.